Bulharsko a Turecko Je zde 1 položka. "Des Koenigreichs Bulgarien Oestliche Haelfte. Nro. 14.". Orig. copper-engraving. 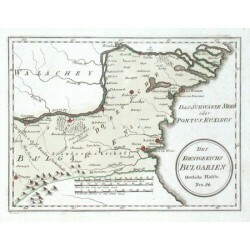 Published by F. J. J. von Reilly, Vienna, 1789. Orig old colouring. With decorative title-cartouche and the scale of map. 21:28 cm.